Autumn is so lovely. The crisp days and golden leaves enhance all of the senses, especially our appetites. In the summer we can be happy with salads and sorbets, but in the autumn we long for heartier food to warm us from the inside outward. Potato soup, sausages, hot salads, dumplings, and beer—the food and drink of an Oktoberfest party—is just what the stomach ordered. Historians say that Oktoberfest originated in 1810 as a wedding feast over in Bavaria. But who cares about little details like that? Despite the name, Oktoberfest is held during the last two weeks of September. In Germany and many parts of the world, Oktoberfest has become a large festival with plenty of food, beer, music, and merrymaking. Huge tents set upon the Theresienwiese meadow in Munich are the setting for the festivities. The event begins with the mayor ceremoniously tapping the Oktoberfest keg of beer. While you don't have to go all-out as they do in Germany, you will find hosting your own Oktoberfest party can be fun and easy. Hold your party outside as they do in Munich. What a great reason to enjoy the autumn weather! Decorate your tables with linens in the colors of the German flag: black, red, and gold, or the blue and white diamonds of the Bavarian flag. Play traditional German music during your party and give your guests kazoos to play along. 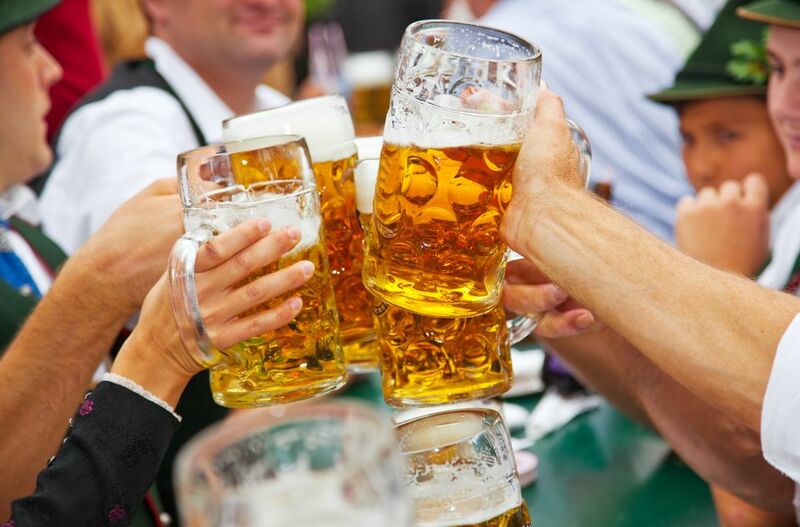 Purchase a keg or two of German beer, or select a variety of bottled German labels for your party. Cook up traditional German food. Go overboard in planning your quantities, as appetites are sure to increase with the crisp autumn weather. Don't forget to gather the troops to do the Chicken Dance after everyone has guzzled a couple of beers. Serve the brews in German beer steins. When your guests become bored with the Chicken Dance, line them up for beer stein races. Fill their hands with loaded steins and have them race to a finish line. The person to finish with the most beer left in his stein wins the race.